Is video poker a good alternative to pokies? Video poker is a good alternative to pokies, and some would say it’s a superior option. 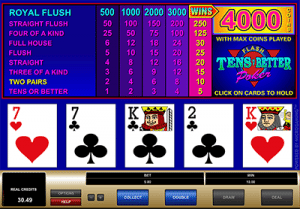 If you’ve never played before, this article is intended to cover everything from the types of games available to some of the advantages of video poker over pokies. If you have played previously, you may still wind up learning something new. Players start by making a bet and pressing the deal button. They receive five cards on the computer screen, and they then have the option of discarding one or more and receiving replacement cards. If the completed hand of the player is good enough, it will warrant a cash payout as listed on the game’s pay table. Better Odds – No matter which pokie you play, the odds will always be in favour of the casino. With video poker, however, playing perfectly can actually give you a slight advantage over the house. Fewer People – People tend to flock around the pokies, while video poker players are able to sit quietly and concentrate without all the usual hustle and bustle. If you don’t like people hovering over your shoulder, give the less crowded video poker machines a try. Skill vs. Luck – Pokies are games of chance, and all the player is required to do is push a button. With video poker, however, there is a distinct element of strategy involved when deciding which cards to keep or exchange. In a broad sense, there are two kinds of video poker machines: full pay and low pay. Full pay machines offer the highest payout percentage for a certain kind of game, while low pay games reduce the maximum payout percentage and increase the house edge. Unfortunately, it’s not common practice to list payback percentages on video poker machines, so the player will need to do some serious research if they hope to find one that gives them an edge over the house. Progressive Jackpot – Numerous video poker games fall into this category. Just like progressive pokies, these machines have a jackpot that rises each time a player inserts money. When a player wagers maximum coins and gets a royal flush, they win the entire amount of the jackpot. Then, the progressive begins again at a predetermined amount. Jacks or Better – Also known as “draw poker,” this is the most popular version of video poker in casinos around the world. It is also known as 9/6 Jacks or Better, as the game pays out 9x the initial wager for a full house and 6x for a flush. In order to receive a payout, the player must make a poker hand that contains at least a pair of jacks. This will pay out 5 credits if the maximum of 5 coins are wagered, while playing a single coin is worth a one-coin payout. The royal flush, meanwhile, is worth 4000 credits for a 5-coin wager and 250 credits for a single coin bet. 9/5 Jacks or Better – The lower-paying version of Jacks or Better. Instead of the player receiving 6 times their wager for a flush, the payout is only five times the initial bet. 6/5 Jacks or Better – The flush payout drops from 6 to 5 times the initial wager, while the bonus for a full house drops from 9 to 6 times the bet. Players wagering maximum coins can expect a payback percentage of 95%. 8/6 Jacks or Better – Another low pay version of the popular Jacks or Better game, this video poker machine retains the 6x payout for a flush, but it also reduces the full house prize from 9 times the initial wager to 8x. 7/5 Jacks or Better – The flush payout is reduced from 6x to 5x, and the full house reward is 7x instead of 9x. The best payout percentage that can be hoped for is slightly greater than 96%. 8/5 Jacks or Better – The payout for a full house drops from 9x to 8x, while the payout for a flush is reduced from 6x to 5x. If you play maximum coins in the hopes of getting the royal flush bonus, you can expect your overall payback percentage to be 97.30%. Deuces Wild – The two card is wild. Otherwise, it functions like any other video poker machine. While the full-pay version can only be found in Nevada, it may be worth the trip; when played with perfect strategy, it offers a theoretical return of 100.8%. A natural royal flush offers the best payout, while four deuces are second in terms of value. Bonus Poker – Like Jacks or Better, but with a higher payout for four of a kind. Tens or Better – Pays 6x for a full house and 5x for a flush. In order to receive a payout, you must have a pair of tens or better. Double Bonus – Another version of Jacks or Better, this time with a bonus payout for getting four aces. A 10/7 version of the game does exist, which offers a potential payback percentage of 100.2 percent with perfect play. 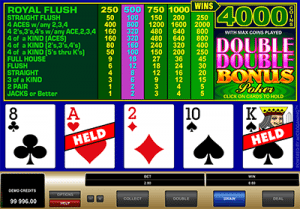 Double Double Bonus – This version takes the four of a kind theme to a new level. Payouts exist for four aces, four aces with a kicker of two through four, and many other options. Like all versions of video poker, though, the top prize is won by getting a royal flush. We’re suckers for any casino game that allows us to hold a possible edge over the house. Is video poker a good alternative to pokies? Considering the above information, the answer is a definite yes, if you’re looking for something a bit different between pokies games. If you’re looking for detailed animation and fun bonus features, the pokies will always be the way to go. We recommend Raging Bull Casino as our top-rated casino site for players from United States, which has a great range of video poker variants to choose from along with hundreds of online pokies.